These ProClick Pronto punched 14mil 8.5" x 11" frost poly covers from GBC are durable, spill-proof, and tear-proof. Additionally, these letter size translucent frost covers will show off your title pages and provide a premium look to your reports and presentations. GBC's letter size frost covers are perfect for use with any binding style (see list below). With more than 200 other frost covers to choose from, you're sure to find the exact cover for your needs. This ProClick Pronto punched 14mil 8.5" x 11" cover's product number is 2000932G and comes in packs of 100. Transcript: These are GBC Frost 14mil 8.5" x 11" Proclick Pronto Covers! These covers are about as thick as it gets, and they are prepunched already to bind your Proclick spines on the go! When using, simple place the cover on top of your project. However, it is best to then flip the back cover over the front to later hide the unsightly part of the spine. Now place in your binding and pinch it together by hand or with the pro click tool. Flip the back cover back over and your project is bound with your frosted covers. Here is a close up look, notice the frost and the thickness of the cover. 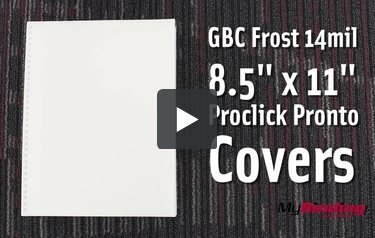 These are GBC Frost 14mil 8.5" x 11" Proclick Pronto Covers!